Private Country Haus mit herrlichem Bergblick und Pool! "Sobald du ankommst, schmilzt der Stress einfach weg!" Genießen Sie die Ruhe und Abgeschiedenheit der High Fields Farm, ein luxuriöses Land Ferienhaus, privat auf 130 Hektar (mit keinen anderen Häusern) mit Blick auf das South River Valley, mit einer atemberaubenden Landschaft von sanft hügeligen Feldern und Panorama Blue Ridge Mountain Views. Das Landhaus auf dem Hügel ist im französischen Landhausstil mit einem Schwerpunkt auf komfortable Eleganz renoviert. Genießen Sie stundenlanges Wandern auf dem Grundstück (einschließlich Ihres eigenen Goodall-Berges! ), sitzen Sie vor dem Feuer oder faulenzen Sie am Pool im Sommer und genießen Sie die herrliche 360-Grad-Aussicht. Der Shenandoah Nationalpark, der Skyline Drive, der Appalachian Trail, Luray Caverns, Monticello, die Universität von Virginia und Montpelier sind nur eine kurze Autofahrt entfernt! KLICKEN SIE AUF UNSERE WEBSITE LINK UNTEN FÜR VIELE WEITERE INFORMATIONEN! Scrollen Sie weiter - es ist etwas heruntergekommen! Sehen Sie sich die Seite "Was unsere Gäste sagen" auf unserer Website an. BITTE BEACHTEN SIE, dass, wenn unsere High Fields Farm für interessante Daten nicht verfügbar ist, unser Carrie's Cottage mit zwei Schlafzimmern (Objekt # 37726) und unser Carriage House Studio (Objekt # 79494), die zusammen sechs Personen beherbergen können. This property was fantastic. A mountain getaway all to ourselves. A great view in every direction. Easy to get to. Very clean - had everything we needed. The kids loved the onsite miniature horses. The fed them everyday. Lots of fishing, playing, hiking all on the property. Hosts were very easy to work with. Very close to National Park. We were so pleased upon arrival to find this lovely ranch home up on a hill overlooking the farm countryside and rolling hills. The home is nicely decorated and comfortable. My favorite moments were waking up, turning on the gas fireplace and enjoying my morning coffee. When it warmed up a little, I'd go sit in one of the rocking chairs on the front porch and take in the lovely views. Unfortunately it was past season for a dip in the pool but that has to be a huge benefit in the summer months. 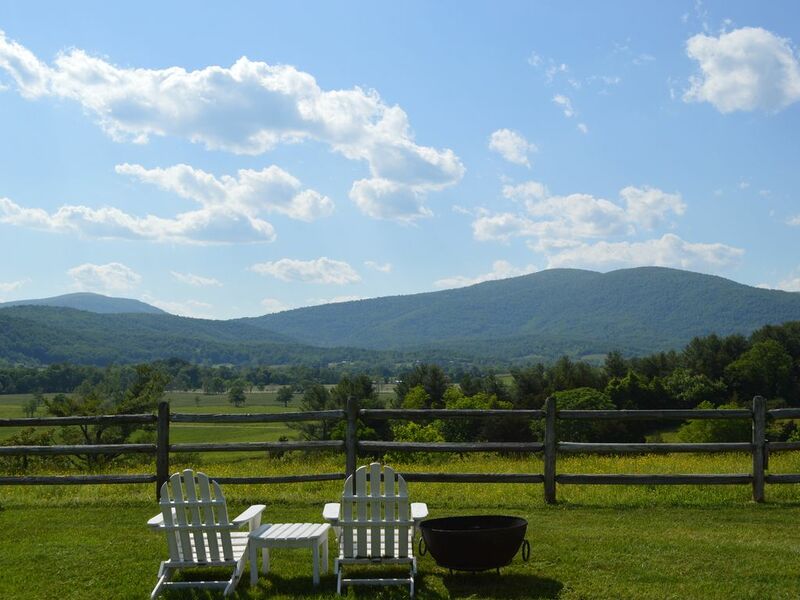 This location is in the heart of great sightseeing (Monticello and Montpelier are nearby), mountain drives and winery excursions. We enjoyed our final evening in the area by dining at the nearby historic Lafayette Inn. We loved it. We'll come back again. This house is immaculate and situated atop a rolling hill with fantastic views of neighboring foothills and mountains. The area is picturesque and wonderfully quiet. We enjoyed morning coffee on the covered porch, watching active bluebirds and the minature horses in the field. The weather and the views were exceptional. The house was immaculate and felt like visiting a relative. This is an excellent place to refresh and renew . He restoreth my soul. We never turned on the TV for fear it might tear us away from for perfectly peaceful weekend. We will return. Thank you, Denise for your lovely review. Our guest do enjoy the spaciousness of our three bedroom High Fields Farm and its stunning mountain views. It is located on its own 130 acre farm with a private pool in-season and two gas fireplaces and outside fire pit for fall and winter. It is one of our three Fairhill Farm Country Vacation Rentals. Our two adjacent farms comprise almost 300 acres with ponds and streams to explore and miniature horses to enjoy. There are over five miles of private trails. We are less than a 15 minute drive from the Swift Run Gap entrance to the Shenandoah National Park, Skyline and Blue Ridge Parkway, and the Appalachian Trail. We are convenient to historic sites such as Monticello, Montpelier, Ash Lawn and University of Virginia. There are a number of excellent wineries nearby as well as antique shops.